Faulks Wodehouse or faux pas? Posted byAbhijit	 March 12, 2013 Leave a comment on Faulks Wodehouse or faux pas? Carry On, Jeeves? No way, not when the Master is dead. The devotees are crying blue murder, aghast at the forthcoming tale about Wooster and Jeeves not written by PG Wodehouse himself . They are astounded by the audacity of Sebastian Faulks, who is adding a sequel to the canon of the late, great Wodehouse. The New Statesman summed up the outrage bluntly. “The hubris of Sebastian Faulks: trying to imitate the inimitable PG Wodehouse,” harrumphed the headline. Faulks is a fine writer who has written good books like Birdsong, The Girl at the Lion D’Or and Engleby. He has also written a James Bond thriller, Devil May Care. But it is one thing to write about Bond or Sherlock Holmes – several other writers have written stories about them; Wodehouse is something else. He is sui generis, peerless, inimitable, incomparable, absolutely unique in English fiction. There are disputes over Shakespeare’. Some of the poems in The Passionate Pilgrim, for example, are said to be the work of other poets. No such controversy dogs the Wodehouse canon. He wrote like no one else. His mix of farce and romantic comedy with side-splittingly funny scenes scripted in brilliant language is absolutely one-of-a-kind. Imagine scenes as funny as the best of Monty Python or Mr Bean, but the cast of characters changed to potty earls, unflappable butlers, bossy aunts and dapper young men about town under the thumb of pretty young women who get them into all kinds of trouble. That’s the Wodehouse world. Where earls potter around rose gardens and moon over fat pigs and young men are driven nuts by adorable but imperious young women. He beams at me. He calls me Bertie. I call him Roddy. To put the thing in a nutshell, the dove of peace is in a rising market and may possibly go to par. Note the classical reference, “the dove of peace”, thrown into a sentence which combines the language of the stock market with a sporting metaphor. It’s often that way with these frank, fearless young novelists. They’re devils on paper, but put them up against a girl who doesn’t come out of their fountain pen and their feet get as a cold as a dachshund’s nose. For Mr Wodehouse there has been no fall of Man, no ‘aboriginal calamity. His characters have never tasted the forbidden fruit. They are still in Eden. The gardens of Blandings Castle are that original garden from which we are all exiled. Faulks admires Wodehouse, too. “I read my first Jeeves story when I was twelve and it is an honour to be asked by PG Wodehouse’s family to work with these greatly-loved characters,” he said. Jeeves and the Wedding Bells, by Faulks, will be published in November. “Wodehouse is inimitable, but I will do the best I can,” said Faulks. But will his best be anything like Wodehouse? 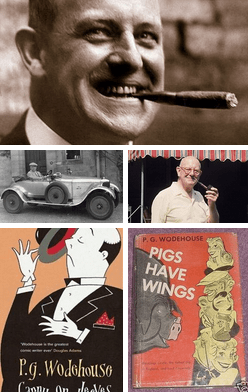 The genius of Wodehouse is like that wave upon the sand – elusive, impossible to pin down.